Ninja Beaver Builder 2.0. Rapid execution, updated features, firmness. The most awaited update is finally out..! The technical team of Ninja Beaver Builder has recently launched its new version 2.0. 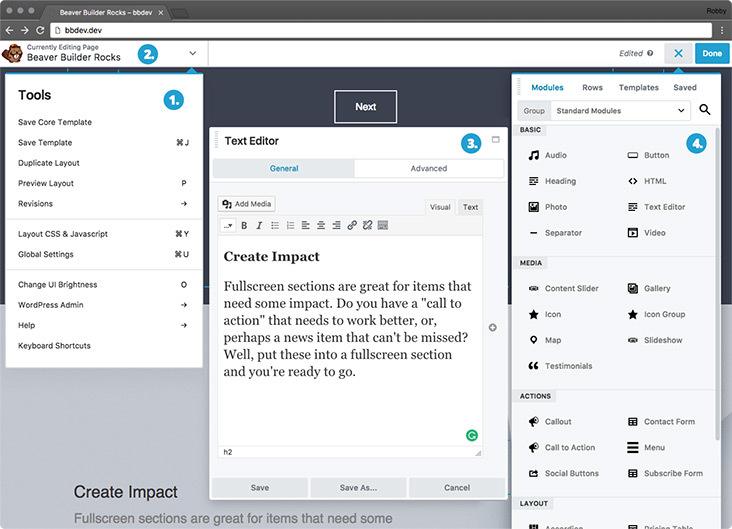 This version has taken features of the page builder to a completely new level. There are many advancements and updates along with the change in the interface. Version 2.0 is playing a real game changer role. Do not wait for others to tell how good the product is, be the first one to give excellent reviews. Download it from the Ninja Beaver Builder website and explore the quality product. : The most noticeable change that will make your routine work of page building as easy as a cake walk is the Interface. This new interface is built in a very user-friendly way which makes the page making process very easy, smooth and quick. : The performance has exceptionally turned better. The pages load very quickly like the module setting page. On an overall basis, the speed has turned really rapid thereby improving the performance. : In order to make it easy to have a clear look, there is a Preview Layout button made available. At any point of time, quickly have a look at your work and that too in multiple responsive displays. Use the P button, to begin the preview mode. : The updated version allows to check the revision history from the Page builder itself. Even the previous version had this feature, but on the default edit page screen and not on the Page builder. This can be done by using the tools in the top left corner of the page. : If your color preference is more towards eye friendly colors, select the dark color themes available which makes it soothing for the eyes. Also effect of less brightness is good for the ones who prefer working at night. Just go to Change UI brightness button in the tools menu and choose the theme you prefer. : The new version allows the user to find out what exactly they are editing. Have a look at the top left corner of the page and you can know the name of the page, CPT, post, etc. : Now you can change the width of the content. In the previous version, every row set was ‘Fixed’ having the same width that was specified in the global settings. This update allows to option to mention the content width of each row separately. : Along with the blazing speed, the new version is smart too! The settings panel once opened remembers the location of the settings window. This feature makes sure that the settings window opens up at the same place where the other one was closed. Really awesome feature, saves the irritation. : In the older version, the settings panel used to overlap the page content which rendered editing to be a very annoying task. Now, it is possible to set the settings panel to the left of the screen. Also an option to keep it floating. Also, use the + button at the top right corner which will collapse the sidebar giving the editor full width and the freedom to edit the page in a hassle-free manner. : Making a twin or duplicate row was available in the previous version too. Now, the same is available for the columns. In order to copy any column, just click on the duplicate button and the work is done. The new update is absolutely worth it, having the best part as the ‘backward compatibility’. If you have not yet tried it, download it from the NINJA Beaver Builder website. Give it a try and you would definitely love it.